Have you ever been cornered at the mall by one of those survey-takers? You know, the kind with the clipboard making a beeline just for you? The kinds of questions they ask always frustrate me because there are not enough options to cover how I really think. So I am pigeon-holed into declaring a position that doesn’t reflect my views! Similarly, we Christians sometimes make a mistake of allowing a false description of God go uncorrected simply because we do not have enough categories in our repertoire. If God is a loving being as you Christians claim He is, then He would not allow any evil! A different version of this might be to set it up so that the very existence of God is at stake, with the presence of evil being proof that He can’t exist. What we need, however, IS a category that allows for a good and loving God who has a good and loving purpose for allowing suffering. Is that so implausible? The aliens would NOT know the reasons behind this incomprehensible series of events and conclude that earthlings are cruel and bizarre. 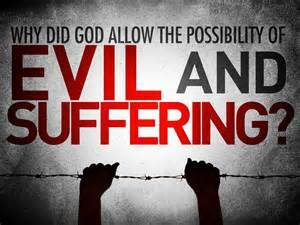 If such a scenario exists to explain and justify a not so ordinary example of human suffering, is it possible that God might have a ‘good’ reason for allowing what we considered evil? This is NOT to deny evil, pain and suffering, but is a justification for forming another category for a God who IS good AND allows circumstances which cause us to recoil since we don’t understand or see the purpose. What we cannot say, like the aliens who don’t have all the information, is that since WE don’t know the reason, there must not be one. Question: Which objection to the existence of the biblical God do you encounter most often?